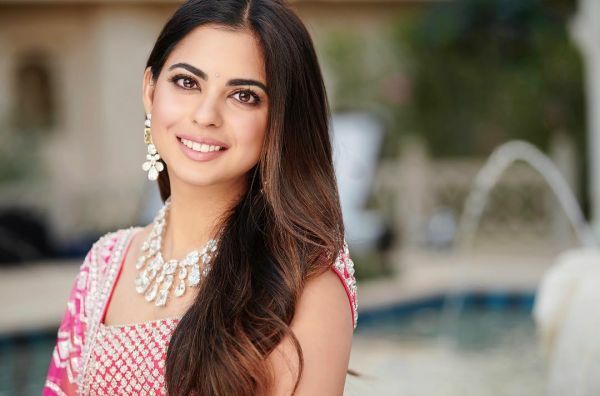 Isha Ambani Looks Like A Modern Day Rajkumari At Her Pre-Wedding Maha Aarti! 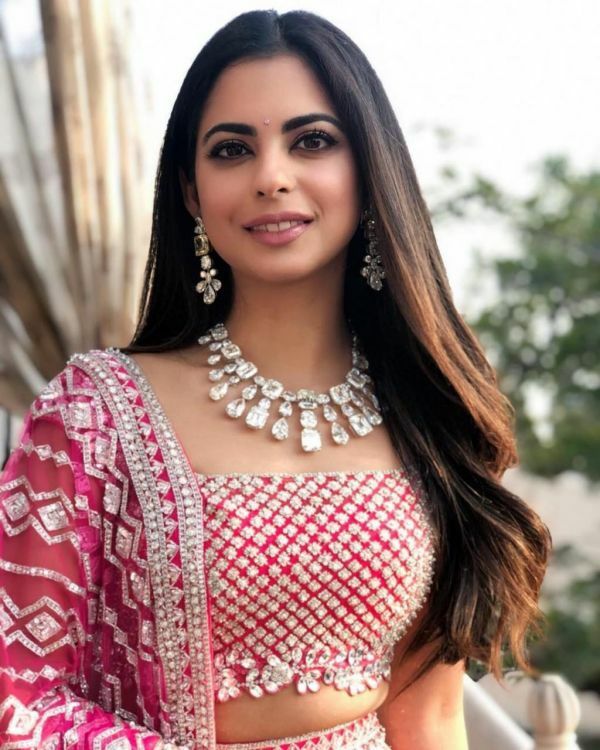 While Isha Ambani has been churning out look after look for her wedding celebrations in designer outfits, we found a few of her pictures from her Maha-Arti which was held on the 10th of December. Isha looked like a true Indian princess in her light pink Manish Malhotra outfit which was heavily embroidered. While the other celebs dressed to their T at her wedding, Isha also left no stone unturned to be the stunning bride that she is. Her makeup was kept minimal while flaunting her bridal glow with blush pink lips, kajal, well-defined brows, lots of mascara, and a bindi of course. The look was put together by Bollywood makeup artist Vardan Nayak and she sported a simple hairdo with soft waves at the bottom to complete the look. We are loving the natural look and are so glad she kept it minimal. Isha's hair was done by Pompy Hans and we cannot take our eyes off the sparkly, big baubles she is seen wearing. It is love at first sight with those dangling earrings and statement neck-piece. She was styled by ace Bollywood stylist Ami Patel and the drape was by celebrity draping artist Dolly Jain. 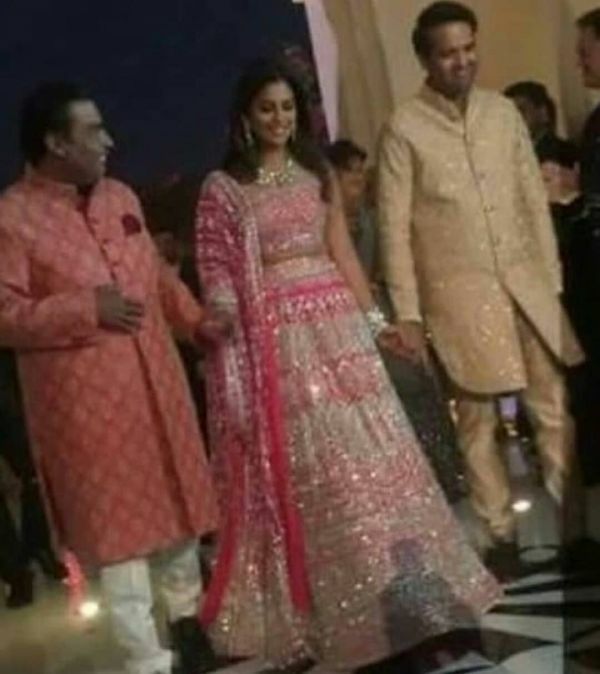 She looked radiant and happy while her father Mukesh Ambani and her brother walked her down for a performance for the festivities. Manish Malhotra also created outfits Nita Ambani for the event with a handwoven vermillion hued silk lehenga adorned with floral streamers in traditional silver zardosi. The vibrant ensemble was tied together with a leheriya inspired dupatta. She looked regal in the outfit and even managed to shake a leg in it. Her bronze eyeshadow and heavily-kohled eyes was certainly on-point too. Major mother-of-the-bride goals here! You can check the best looks that celebs sported for the Ambani wedding here.